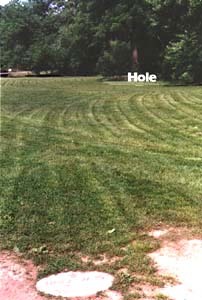 Hole # 5 is a beautiful hole, with the Pole Hole set on a peninsula that is circled by the creek. Usually a straight shot down the fairway will set you up for a good second shot, but the kong arms may want to try a big left to right, as the creek and some trees block the Pole Hole from the tee on the right side. But WATCHOUT! The creek runs down the right side of the fairway, curves right and then curves left behind and to the left of the Pole Hole. This hole is an easy place to get wet. The creek lies about 12 feet behind the Pole Hole, so once again, laying up short is often a good idea. 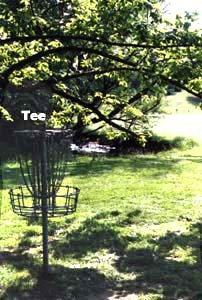 A tree over the Pole Hole forces all putts low.